We are excited to announce that Sarah Wagener, the current Fellowship Network Coordinator for the Doris Duke Fellowships, will become the Fellowship Manager on September 1st. Sarah has served in her current role since June 2016 and has played a key role in managing fellowship sustainability initiatives and supporting fellows and mentor relationships. Lee Ann Huang, who has served as Fellowship Manager since 2010, was instrumental in developing and strengthening the fellowship’s structure and will continue to support the fellowship as Strategic Adviser. Lee Ann and Sarah will work closely together to ensure a successful transition. We are all excited to continue supporting fellows and implementing a strong fellowship program! Cohort Eight applications to the Doris Duke Fellowships are now open! The Doris Duke Fellowships team will host an application webinar for doctoral students who are interested in applying to be a part of Cohort Eight. The webinar will include an overview of the fellowship goals, structure, and participation expectations, as well as instructions on how to craft a strong application. We look forward to prospective fellows joining us on Tuesday, September 26 from 12:30-1:30 PM CT. Register for the webinar here. If you have any questions, please email ddfellowships@chapinhall.org. We are excited to be partnering with the University of Oklahoma Health Sciences Center to host the Mid-Year Meeting in Oklahoma City. The Mid-Year Meeting will be held April 11-13, 2018. Current fellows, graduated fellows, and mentors local to Oklahoma City are encouraged to save the date! Doris Duke graduated fellows launched The Fellows’ Blog in January 2017. This blog showcases Doris Duke fellows’ original research with a goal of making content accessible to policymakers and practitioners. The content of the blogs represents the individual opinions of the authors and in no way represents the opinions or positions of the Doris Duke Fellowship for the Promotion of Child Well-Being, the Doris Duke Charitable Foundation, or Chapin Hall at the University of Chicago. 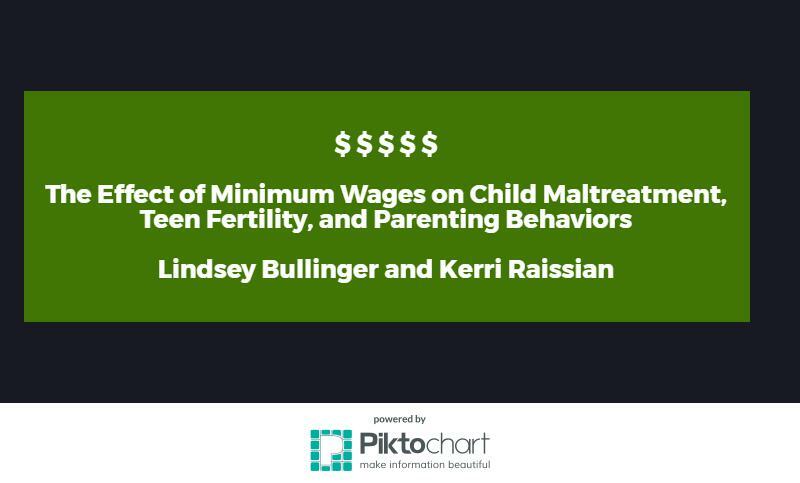 This month, Lindsey Bullinger (Cohort Six) and Kerri Raissian (Cohort One) explore the effects of minimum wages on a variety of dimensions of child well-being. Read their cross-cohort collaboration blog post here. The end of summer has been a busy, exciting time for Doris Duke Fellows! Check out their updates! Nate Okpych, a Cohort Five fellow, is the recipient of the Council on Social Work Education’s 2017 Transforming Child Welfare Dissertation Award. Nate’s dissertation, “Make or Break: College-Going and College-Leaving Among Foster Care Youth,” focused on identifying and examining individual, college, and policy factors that impact college entry, persistence, and completion among foster youth. Katie Paschall, a Cohort Four fellow, is now serving as a Research Scientist at Child Trends. Katie is working in Child Trends’ Early Childhood topic area in their Minneapolis office. Francie Julien-Chinn, a Cohort Five fellow, Megan Hayes Piel, a Cohort Three fellow, Jen Geiger, a Cohort One fellow, and Cynthia Lietz, an Academic Mentor have an article in press in the Journal of Family Social Work titled, "Examining risk, strengths, and functioning of foster families: Implications for strengths-based practice."